Franchy Vargas Cordero…signed by Padres scouts Felix Feliz, Martin Jose and Randy Smith. Began the season on the 10-day DL with a left abductor strain before appearing in 40 games (36 starts) with SD… underwent season-ending surgery in July to remove a bone spur in his right elbow...Sent on a rehab assignment to El Paso (AAA) on 4/6 and hit safely in all four games (.412 average) before being reinstated from DL on 4/11...Slashed .237/.307/.439 for SD with five doubles, one triple, seven home runs, 19 RBI and 19 runs scored...Made 36 starts in the outfield, including 22 in LF, 10 in CF and four in RF…posted a .955 fielding percentage with three errors and two outfield assists...Hit a 489-foot HR on 4/20 vs. ARI at Chase Field, the second longest HR in the majors in 2018…his 439-foot HR average (min. 80 batted ball events) led the majors..Homered in back-to-back games for the second time in his career on 4/27-28 vs. NYM at Petco Park…his 459-foot HR on 4/28 was his second-longest of the season and the 116.9 mph exit velocity was the hardest hit ball by a Padre in 2018...Hit six balls with an exit velocity of 115.0 or higher in April, which were six of the seven hardest hit balls by a Padre in 2018... Hit safely in 18 of his first 26 games from 4/11 to 5/10, posting a .281/.349/.500 line with three doubles, six HR, 15 RBI and 14 runs scored... Slashed .140/.213/.302 over his final 14 games from 5/11-27 before being placed on the 10-day DL on 5/28 with a right forearm strain... Appeared in three rehab games for ELP from 6/14-17 before being transferred to the 60-day DL on 6/21...Hit .263 (10-for-38) with RISP and .368 (7-for-19) with RISP/2 out...Following the season, played for Estrellas de Oriente in the Dominican Winter League, helping the club to their first championship in more than half a century...hit .232 with nine XBH across 26 DWL games. Spent the majority of the season with El Paso (AAA) and received his first action at the ML level, appearing in 30 games for SD... Began the season with El Paso, hitting .289 (50-for-173) and leading the Chihuahuas in hits at the time of his call-up... Made his MLB debut on 5/27 at WSH as a pinch-hitter... Recorded his first ML hit and multi-hit game on 5/28 at WSH during his first start as a Padre…went on to hit in five consecutive games from 5/28-6/2, batting .368 (7-for-19) with one double, one triple, five runs and one stolen base... Hit his first ML home run on 6/12 vs. CIN before hitting two additional homers the following day on 6/13 vs. CIN, marking his first-career multi-home run game and the first time he homered in back-to-back games... During a three-game span from 6/12-14, went 7-for-14 (.500) with one double, three homers, five RBI and five runs scored... Recalled from El Paso for his second stint of the season with the Padres on 7/19... Grounded into one double play in 2017 while with El Paso, tying the record and becoming just the third qualifying batter in Pacific Coast League history with only one GIDP... Hit 18 triples with El Paso, a Chihuahuas' single-season record and tied for the most in minor league baseball with Double-A Midland's Jorge Mateo... Led all of professional baseball in triples with 21, including the three he hit for the Padres... Contributed to El Paso's postseason run, posting a .355/.417/.516 mark with two doubles, one home run, two RBI and three runs scored... Following the season, was named Most Valuable Player and Rookie of the Year of the Dominican Winter League... hit .323 (60-for-186) with a .393 OBP and seven doubles, five triples, five home runs, 25 RBI and 30 runs scored in 50 games for Leones del Escogido...hit .296 with a .367 OBP in 17 games during the playoffs. Split the season between Single-A Lake Elsinore, Double-A San Antonio and Triple-A El Paso, batting a combined .290 (161-for-555) with 24 doubles, 16 triples, 11 home runs, 54 RBI, 79 runs scored and 23 stolen bases. Spent the majority of the season with Lake Elsinore, hitting .286 (85-for-297) with 16 doubles, eight triples, five home runs and 35 RBI with 47 runs scored. Made a four-game stint with Triple-A El Paso, scoring one run with one hit and three walks. Named the Texas League Player of the Week on 8/7 after batting .400 (8-for-20) with three doubles, a triple and five RBI in five games while with San Antonio. Was named as a 2016 MiLB.com Organizational All-Star for San Diego. October 30, 2018 San Diego Padres activated LF Franchy Cordero from the 60-day injured list. June 21, 2018 San Diego Padres transferred LF Franchy Cordero from the 10-day disabled list to the 60-day disabled list. Right forearm strain. June 14, 2018 San Diego Padres sent OF Franchy Cordero on a rehab assignment to El Paso Chihuahuas. May 28, 2018 San Diego Padres placed CF Franchy Cordero on the 10-day disabled list. Right forearm strain. April 11, 2018 San Diego Padres activated CF Franchy Cordero from the 10-day disabled list. April 6, 2018 San Diego Padres sent CF Franchy Cordero on a rehab assignment to El Paso Chihuahuas. March 28, 2018 San Diego Padres placed CF Franchy Cordero on the 10-day disabled list retroactive to March 26, 2018. Left abductor strain. 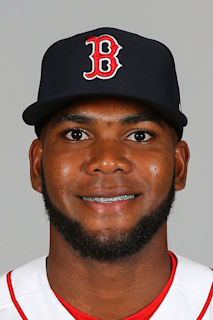 October 14, 2017 OF Franchy Cordero assigned to Leones del Escogido. October 14, 2017 Leones del Escogido placed OF Franchy Cordero on the reserve list. October 2, 2017 San Diego Padres recalled CF Franchy Cordero from El Paso Chihuahuas. July 23, 2017 San Diego Padres optioned CF Franchy Cordero to El Paso Chihuahuas. July 19, 2017 San Diego Padres recalled Franchy Cordero from El Paso Chihuahuas. June 30, 2017 San Diego Padres optioned CF Franchy Cordero to El Paso Chihuahuas. May 27, 2017 San Diego Padres recalled Franchy Cordero from El Paso Chihuahuas. March 18, 2017 San Diego Padres optioned CF Franchy Cordero to El Paso Chihuahuas. November 18, 2016 San Diego Padres selected the contract of Franchy Cordero from El Paso Chihuahuas. September 2, 2016 CF Franchy Cordero assigned to El Paso Chihuahuas from San Antonio Missions. June 30, 2016 CF Franchy Cordero assigned to San Antonio Missions from Lake Elsinore Storm. April 4, 2016 OF Franchy Cordero assigned to Lake Elsinore Storm from El Paso Chihuahuas. March 31, 2016 OF Franchy Cordero assigned to El Paso Chihuahuas from Fort Wayne TinCaps. March 6, 2016 OF Franchy Cordero assigned to San Diego Padres. April 5, 2015 OF Franchy Cordero assigned to Fort Wayne TinCaps from Tri-City Dust Devils. May 1, 2014 Franchy Cordero assigned to Eugene Emeralds from Fort Wayne TinCaps. March 31, 2014 SS Franchy Cordero assigned to Fort Wayne TinCaps from AZL Padres. March 2, 2014 SS Franchy Cordero assigned to San Diego Padres. April 4, 2013 SS Franchy Cordero assigned to AZL Padres from DSL Padres. June 2, 2012 Franchy Cordero assigned to DSL Padres. November 1, 2011 San Diego Padres signed free agent SS Franchy Cordero to a minor league contract.